Team 2 is off the mountain and back in Talkeetna Alaska after a successful expedition. This is the final dispatch for the group. Congrats to all members of Team 2 and great work by the guides! Greetings from 14,000'!!!! Guide Aili reports they have all moved up to Camp 3. Today the team spit up the work load, half the team went back down to Windy Corner and retrieved the supply cache while other worked on fortifying the camp including their own private bathroom. There is some disruption in the message but it appears they plan to place a cache around the fixed lines in preparation to move up to high camp in the coming days. Photos courtesy of AAI Archives. Guide Jeremy called in today's report that the team has moved up to Camp 2. In true alpine form they woke up at 4am ate breakfast, broke camp and were moving by 6am. They reached Camp 2 around 2pm. Team members Ben and Arrak got on the phone to send messages back home. Enjoy! Lead Guide Aidan Loehr called in notifying that Team 2 summited! "Hey this is Aidan from AAI Denali Trip 2. It is about 2:00AM this morning. Calling in to let everyone know that we summited in near perfect conditions. One of the few trips I have been on where everyone summited the mountain together. We had near perfect summit day conditions. It took us about 13 and a half hours roundtrip to get back here to 17 Camp. Everyone did pretty well. We had to skip the rest day yesterday because the weather was starting to move in so everyone is pretty tired but quite happy. We had two rope teams heading up the mountain. Only needed about 20 minutes on the summit. The weather on top was actually better than anywhere else. relatively low winds, we were experiencing 35km winds most of the way but the summit was pretty calm. Everyone did well. There were some doubts about people maybe considering turning around but they all pulled through and we had a great time. We will hopefully be moving down to 14 today and then out the airstrip the next. Everyone is in bed resting, I am currently making ramen and am going to go wake them up and see if they want a 2AM dinner. Talk to you all later." After all the weather Ian called in to report Team 3 was finally able to move up to Camp 3 14,200'. Travel conditions were great with help of all the new snow. It was one of the bigger days so far, but the team did great and morals are still "off the chart." They enjoyed some Thai noodles for dinner which also happens to be the teams favorite meal so far. Paul called in to announce, Team 1 has moved up to Camp 1. They left around 5am and arrived around 9:45am. They plan to place a cache around 10,500' then return back to Camp 1. They hope to make a quick turn around and be up at Camp 2 within the next day or so. Everyone is doing well. Team members Steve and A.Shahrom send messages back home. "Hi this is Aidan with Denali trip 2 with the American Alpine Institute. Today is May 26th, I can't really remember what day it is, but we are at High Camp (17,300ft) which is very exciting. We left at 8:05AM this morning, we were really the only big team that moved up to 17 which is nice so we weren't crowded on the fixed lines and on the ridge. The plan currently is to push for the summit tomorrow or Thursday morning as we have a pretty good weather window that we are trying to thread the needle of. Everyone did really well actually, moving to High Camp. It is possibly the toughest day of the entire expedition. The total time was 8 hours of travel at altitude. I will give everyone a last minute briefing tonight in the cook tent before we go to bed so they are prepared for the coming days and hopeful summit attempt. We are all trying to enjoy our US Freeze dried meals, I am currently waiting for my spaghetti and meat sauce to solidify. Stefan wants to say he misses his girls back home. He is cracking the whip on us so he can get back and see them. Andy misses his parents and sister desperately. I miss my favorite dog who anxiously waiting for me to get back. Alright I am going to get back to my freeze dried and hopefully we will be calling in with good news. This is Aidan over and out." *** This Dispatch Covers the last 3 days of Team 2's movements/updates. "Hi this is Aidan AAI Denali Trip 2. We are at 14 Camp experiencing some strong winds rolling through camp. We are in the middle of a small storm. It seems to be storming above us and below us. Kind of how Denali works. We walked out to the edge of the world two days ago. Not the best view, but its better than no view and great to get a little exercise. We were able to cache above the fixed lines right around 16,200ft so we are in a great position to push for the summit as soon as we get a weather window. While we have been waiting for the weather to clear up, the group has been partaking in some very spirited discussions and chess matches. The most fierce game of chess I have ever seen between Andy and Mathias. A lot of mental energy being expended in the cook tent. There was an intense game of frisbee in camp today as well. Everyone took part and seemed to be having a good time. I worked mainly as an official and to make sure no one got too far out of bounds or too close to the crevasse areas. The forecast is predicting a change towards pleasant weather in the next couple days and we are hoping to be in the middle of that as we try to move up to high camp. I am going to head back to the cook tent and see how the chess game is going. Over and out." Lead Guide Chad Cochran called in on Memorial Day Monday - May 25th with an update for Team 3. The group is still at Camp 2 around 11K', but was able to place a cache just below Camp 3. They are hunkering down and waiting for the weather to shape up and the winds to dissipate before they make their move up to the next camp. Rob sends a Happy Anniversary back home! Guide Jeremy Devine called the first update: The team successfully landed on the glacier on Sunday May 24. 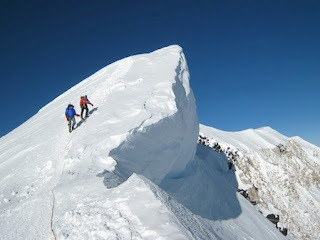 The day will be spent working on skills and preparing for the move up the glacier. Guide Ian Mceleney called in on Saturday May 23rd updating us with the status of the expedition. The team is still at Camp 2 waiting for a weather window to cache near Windy Corner before moving up to 14K' Camp. Everyone is doing fine and enjoying the rest days. Team 3 celebrated Aili's birthday at Camp 2 - 11,200'. Everyone did well with the move up the to the new camp. Dinner was red curry with salmon and bacon mixed in. The phone was passed around the group, so team members could send well wishes back home. Enjoy! "This is Aidan with Denali Team 2. It is Day 10, May 21st of our expedition. It's hard to keep track of what day it is on expeditions like these but I believe it is Thursday night. We spent today at 14 Camp in some very stormy weather. High winds and blowing snow all through camp and all through the day. A small group, led by the magnificent Andy Stephen went down to retrieve our cache at 13,500ft. We had the docs at 14 visit our cook tent for about an hour to let everyone know whats going on and what to expect as we higher up the mountain. Worked on some skills for the fixed lines incase we are able to make a cache in the next couple days. We spend a couple hours as a team working on the walls around our tent. The forecast is bad for today and tomorrow but then it is predicted to clear up. The whole team is pretty psyched about our position as we patiently wait for a good weather window to move up. That's all for now and we will check in with you all tomorrow." Team 3 moved a cache up to 10K' today in preparation to move up to Camp 2. They were in a little bit of a white up, but the wands embedded in the snow made it easy to navigate. Everyone is in high spirits and staying strong. Dinner was mac and cheese with bacon and some fresh greens. Paul called in to summarize their final days on Denali. Team members Amber and Serena and Guide Quino, split up from the rest of the team and were able to get up around 17K' on a summit attempt, but had to turn around around 17K' due to high winds. Meanwhile, the rest of the team guided by Paul descended a day earlier. Everyone is now back down and off the mountain. Team 1 celebrated their hard work with some delicious local fare in Talkeetna. Lead Guide Aidan Loehr called in at 9:30AM this morning. The team has successfully made it to 14 Camp. They arrived last night after moving from 11 Camp, up Motorcycle Hill, around Windy Corner and then settled in. Winds were still substantial but the group made a strong push through and will get take a well deserved rest. They spent a couple hours building snow walls to help protect their tents from the high gusts of wind. They had a delicious burrito dinner last night and will go to retrieve the cache they left at 13,500 later today or tomorrow before making a plan to move higher up the mountain. The Team is set up very well and is right on schedule. Day 3 for Team 3. In true alpine form, the team woke up really early around 3am to take advantage of the re-crusted over snow surface from the cool night temperatures. The team moved across the Kahiltna glacier past Mt. Frances and Mt. Crosson, taking hourly breaks for food and hydration along the way. They arrived at Camp 1 around 1pm in the afternoon with everyone feeling great. They enjoyed Middle Eastern Supreme for dinner and tucked into bed early. Team 3 has arrived at Base Camp. 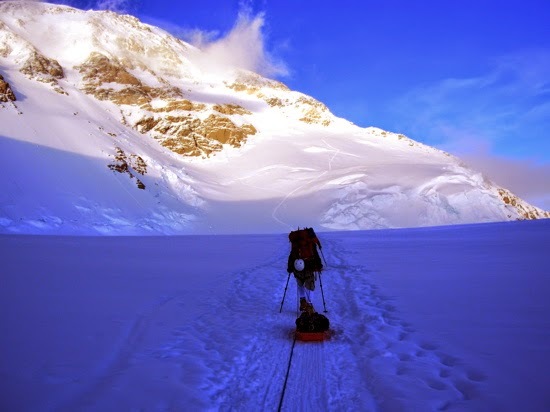 Guide Ian shares the days adventures: They woke up in Anchorage, drove up to the town of Talkeetna at the base of Denali, saw some moose, met with the Denali Climbing Rangers and enjoyed some pizza for lunch. In the afternoon, they got into two planes and flew on to the Kahiltna Glacier. The spent the rest of the day establishing camp, working on skill, acclimatizing, and getting used to glacier life. Aili called in with a report on their first full day at Kahiltna Base Camp. For breakfast they enjoyed some re-heated cinnamon rolls from the Roadhouse Bakery in Talkeetna. Team 3 used the afternoon to review skills such as knots they will be using to tie into their ropes and how to pull a sled. They took a walk to the radio control tower, saw some pretty big crevasses, and came back for lunch and a rest. They plan to move up to Camp one on Tuesday. "Good evening. This is Aidan with Denali Trip 2. It is May 19th, Day 8 on the mountain for us. We took a weather day today. It was looking pretty nasty and uncomfortable up at Windy Corner and as the day went on it continued to get worse which verified that we made the right call. It was a very uneventful weather day. We rested. Sat around Camp. Ate a lot. Got a lot of tent time. Pulled some jokes. And luckily the weather has cleared up quite a bit in the last few hours making our move to Camp 3 (14,200ft) a much more realistic goal for us tomorrow. That's it for this evening. We hope to be calling you from 14 Camp tomorrow. Bye now." "This is Aidan with Denali Team 2. It is Day 7 for us, and it is May 18th which is a Monday. We are sitting at Camp 2 at 11,000 ft.
Today we cached around Windy Corner just over 13,000ft, in ideal conditions. It was a little windy at the corner, actually it was windy all day but you know, it's a mountain. But the day went really well and everyone did great. We got to observe a crevasse fall from a distance on another team today which is always exciting. We thought we might be able to help with a rescue but the team had it well in hand. Tomorrow we should be able to make it to 14 Camp if the forecast holds. Everyone seems to be in good spirits and that's it for now. Adios." Paul called in to report Team 1 is still at 14,200' where they have been for the past 3-4 days. A weather system has moved in bringing winds of 63mph. The team fortified the entire camp with snow walls and tied everything down to help shelter themselves out of the wind. They safely made it through the night with the only real disturbance being the consistent flapping nylon tent walls. Saturday was a beautiful day, but high winds and negative temperatures are in the forecast for higher up on the mountain. With the end of the trip coming down the pike, the team will make a final decision on whether or not continue up or to descend. We will post the Teams final decision tomorrow. "Hi this Aidan with Denali Team 2. We are at Camp 2 (11 Camp). We just finished dinner and well, we were going to have everyone say something to anyone back home. But they are actually all out side with the Norwegian team that has been shadowing us, all the way up the mountain. They are all outside with that group singing national anthems and trading country flags. It's really fun to listen to and to watch from the cook tent. The weather forecast for the next week looks fantastic. Winds dying down and blue skies. 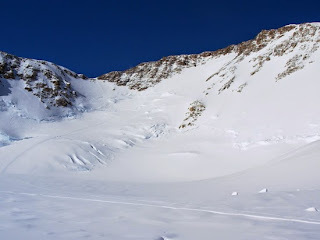 Our plan is to cache up around Windy Corner (13,500ft) tomorrow and then weather permitting make our way up to 14 Camp. Have a great night and talk to you all soon. This is Aidan, over and out." "Hi this Aidan with Denali Team 2. We made the big move form Camp 1 to Camp 2 (11,000ft) today. Really great glacier conditions and beautiful weather as we moved up the Kahiltna. We made it here in about 6 and half hours closer to 6 hours and 45 minutes, but it was a very strong move and everyone did very well and are happy to be here. I am calling from the cook tent this morning. Guide Andy Stephen is currently making pancakes for the team so that should put everyone in an even better mood. Great to be at Camp 11 with everyone in great shape, and yeah we will talk to you later this evening. Lead Guide Aidan Loehr called in at 9:06AM on 5/16 giving us an updates from the 5/15. "Hi this Aidan Denali Team 2. We are at Camp 1 (7800ft). We took a rest slash weather day today. We ate, rested and dried ourselves and our gear out. The winds blew all night with a lot of snow. Pretty strong gusts. However, the forecast is for the winds to decrease throughout the day so hopefully we will be able to leave later tonight. We are going to have breakfast in a few minutes and hopefully be making our way up in a few hours. Everyone is doing great, as they are a very jovial crew. Talk to you all soon. This is Aidan over and out". Aidan called in at 8:30 AM this morning (5/15) to give us an update on Team #2’s situation. The team had just finished a breakfast of French toast and was settling into a rest/weather day at 7800 ft. Yesterday the team cached supplies at about 10,000 ft. near Kahiltna Pass, in preparation for moving up to Camp 2. The day started off mild, with low cloud and some fog, and the team hauled sleds to the cache point. After completing the cache, they began the descent in worsening weather. By the time they arrived back at camp around 5:00 PM, the wind had stiffened and snow was accumulating. The guides prepared a hearty meal of spaghetti with tomato/meat sauce. After dinner, the guides listened to the weather report from Base Camp. With snow and rising wind forecast for the next two days, they decided to hold in camp and wait for a break. Team 1 arrive at Camp 3 on Tuesday evening around dinner time and in the bitter cold. They woke up Wednesday morning to a beautiful sunrise and warmer temperatures. They spent the day building snow walls around the camp and retreated down to pick up supplies from the cache at 13K'. The team celebrated the big move up with a Thanksgiving dinner of chicken, stuffing, cranberry sauce, and veggies. All in all it was a good day. Lead Guide Aidan Loehr called in at 11:33PM last night (5/13) to update us with Team #2’s movements. “Hey this is Aidan with Denali trip 2. We are sitting in camp 1 now. We flew into the airstrip at the base of Mt. hunter last night in near perfect weather last night. Pretty awesome flight, just doesn’t get much better than that. We got a good weather forecast for today. Practiced some skills at night and got everyone in bed at a reasonable hour, ‘reasonable-ish’. We got up early and had a 6AM breakfast, reviewed some more skills and got out of camp at 1015, heading up to Camp 1. Again in near perfect glacier conditions. Few clouds in the south that developed throughout the afternoon but we knew that was going to happen. Forecast calls for some winds out of the southwest but that shouldn’t affect us much down low. We arrived to camp in great shape in 5 hours 45 minutes. Could have gone faster but there was no reason to push it and tire people out. Team seems to be in good spirits and they handled the day well. We are settled in camp now with low visibility with some snow showers but nothing impassable for us looking forward. We will have a carry day tomorrow before moving up to Camp 11. Everyone is bedded down for the night and we are enjoying chatting about climbing in Switzerland. Guide Quino called in with today's report. The team woke up to a chilly morning, but they were still able to climb up to 13,500', just short of Camp 3, and place a food cache. They returned back down to Camp 2 for the remainder of the day and one more night. Once the morning chill gave way, the day proved to be a beautiful one - no wind and a clear sunny sky. Conditions are predicted to be the same for Wednesday's big move up to 14K'. Somewhere in this food cache (hopefully not devoured just yet) is a little treat sent to Team 1 by Girl Scout Troop 44373. The troop hopes some celebratory ThinMints will be enjoyed by the team at the highest point in North America. The cookies left Bellingham Washington on April 22. To read about the start of the journey visit the Peggy McKinley blog post. Lead Guide Aidan Loehr called the office from the K2 Aviation hangar at 5:00PM (PT), notifying us that the team is currently boarding the bush planes that will land them on the Kahiltna Glacier. Making camp and working on skills will be on the agenda for this evening before moving up the glacier. Looking forward to a detailed dispatch tomorrow. Team 1 has been sitting at Camp 2 around 11,000' waiting out a wind and snow storm. They hope it will clear up by Tuesday, so they can move up camps. Everybody is now well rested and well hydrated from their flow of hot beverages during this down time. The group sends a big shout-out "Hello" to everyone back home. Lead Guide Paul Rosser called in early this morning from what would be 11 Camp. There was a very poor connection with the SAT Phone because of the location and we were not able to hear much. What we were able to distinguish amongst the several friendly accents of Georgia, Australia, and New Zealand was "everyone is having a great time and we are having fun", accompanied with a lot of background laughter. Yesterday, Team 1 was able to move up from Base Camp up to Camp 1. Today, the team spent a leisurely morning enjoying french toast and coffee at 8700'. Following breakfast, they carried their first cache up to 10,200' before returning back down to Camp 1 for dinner and a quiet evening. Everyone is doing well. Friends, family, and fans of Team 1 are welcome to leave comments below. When the guides check in to the AAI office via satellite phone, we can relay them back to the climbers. Denali photos courtesy of AAI archives. Paul and Higinio called in yesterday for the first Denali Expedition of the season. Photos Courtesy of AAI Photo Archives.